Wash and trim bhindi and cut them into 1″ pieces. Or thaw if frozen. Once it crackles, add turmeric powder and then bhindi cuts in pan. Keep the flame high and add salt, lemon juice in to it. Mix everything well and cook it for around 5-6 mins and then add crushed peanuts along with all the spices. Take it off the flame and add yogurt into it and stir for a while. Back on the heat and cook for around 7-8 mins. I eliminated green chillies from the original recipe. I used frozen okra so it already had some amount of water after thawing process. Wanted to keep it dry as I had another gravy for dinner! Pari gave a wonderful tip of adding a few drops of lemon juice prevents stickiness in bhindi. 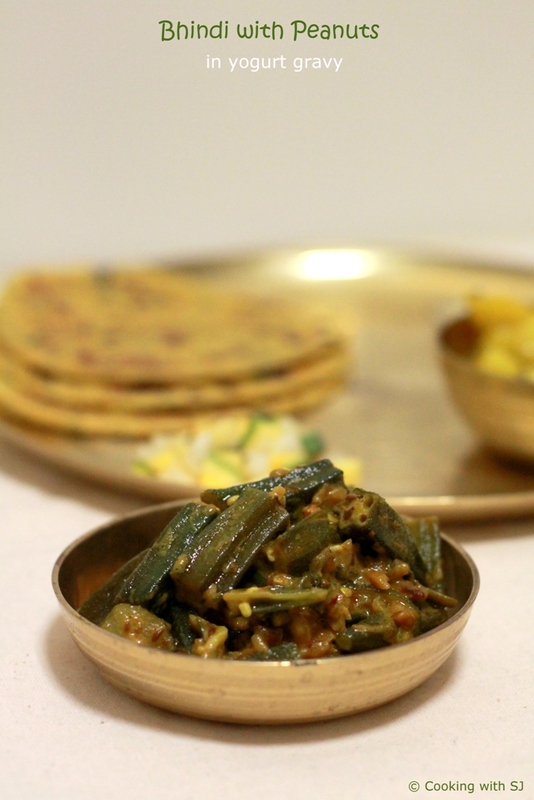 I use frozen bhindi all the time and that is my only option :( Love bhindi and love this recipe, will try it. Peanut sounds like a great addition here! Love it Shruti! I have two queries.My mom used to say that we should not cook after adding lemon juice.True? ?